Destroy this card during your 3rd Standby Phase after activation. 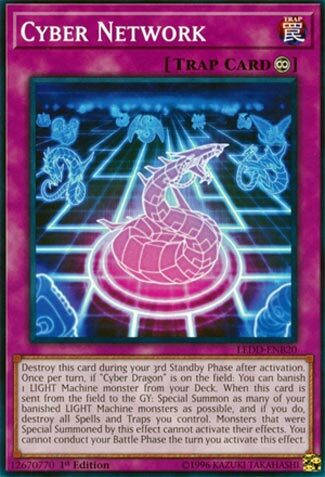 Once per turn, if “Cyber Dragon” is on the field: You can banish 1 LIGHT Machine monster from your Deck. When this card is sent from the field to the GY: Special Summon as many of your banished LIGHT Machine monsters as possible, and if you do, destroy all Spells and Traps you control. Monsters that were Special Summoned by this effect cannot activate their effects. You cannot conduct your Battle Phase the turn you activate this effect. Cyber Network is a swarm card that takes time. You’ll get three turns with this card on the field at most due to its destruction effect. You could get a potential of seven removals before this card destroys itself, but the requirement of having a “Cyber Dragon” on the field hurts it. You get those monsters back from removal at the cost of all your spell/trap cards, which forces you to play around that effect. On top of that, the monsters you removed with Cyber Network can’t attack the turn they get Special Summoned back and they are vanillas, double negatives against Cyber Network. Despite all that, you are still getting your choice of LIGHT Machine-Type monsters to banish each turn, and that can add up to some powerful attacking monsters. Monsters that gain effects in or going to the grave will still get them, and you can always use the monsters for Special Summons of new monsters. If this card survives long enough you will have a load of monsters. If it survives one turn you’ll at least break even and it does thin the deck. Continuous Trap Cards that require a specific monster to be on the field are bad. Cyber Network is bad early game. It destroys itself during the 3rd Standby Phase after you activate it. While it’s being continuous, you can banish a Light Machine from the Deck, but only if Cyber Dragon is on the field (either side). Then if you’re lucky, when this goes from the field to the grave, you can Special Summon neutered Light Machines from banished land. No Battle Phase the turn it’s activated though and all of your Spells and Traps are destroyed. Restrictions on Return from the Different Dimension were necessary, but these were too much. Cyber Dragon week continues with the Trap that was released in the Cyber Dragon Structure Deck in 2014, and got an Ultra Rare reprint in the Legendary Dragon Decks, Cyber Network. Cyber Network destroys itself after the 3rd Standby Phase post activation, so this can only mean the effect is busted. Once per turn, if a Cyber Dragon (specifically Cyber Dragon, or cards that treat themselves as Cyber Dragon) is on your field, you can banish a Light Machine from the deck. When this card is sent from the field to the GY, remember this card kills itself, you can summon as many banished Light Machines as possible, then destroy all Spells and Traps you control. Monsters summoned off this effect cannot activate their effects and you cannot attack the turn you activate this effect. The card needed some drawbacks from being overpowered, but gaining massive board presence is worth it. The card is pretty cool in the Cyber Dragon deck, worth playing 1 or 2 of. Ahh, another swarming card that prevents you from doing Battle. You lose all Magic and Trap cards you control when this card is destroyed (and it does destroy itself after the 3rd Standby after activation, assuming it isn’t destroyed prior). I do like this card though. It’s a good setup card. Yugioh taught us in years recent that being able to swarm, even without attacking, is still a good thing. Note, if this card is removed from play, you get nothing, it has to go to the Graveyard. But even if it survives just one turn, and you get one Monster back, you still breakeven. Everything after is a +1 in your favor! Powerful and balanced support. These are the types of cards that should be made.